Genesis 3: No Curse on Adam and Eve. “μη γενοιτο”! What does Creation Ministries International say about it? What does Bible.Org say about it? It Sounds Like a Curse! The whole purpose of the Balaam narrative is to demonstrate that it is impossible to curse the people of God. They are a blessed people. But why can they not be Cursed? How can God curse himself? But wait! Didn’t Jesus “become a curse”, and free us from it??? 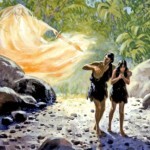 It is said (widely, but for example at Bible.Org), that when Adam and Eve sinned, God cursed them. This is not true, and I plan to demonstrate not only the fact, but also the theological reason why, it cannot possibly be true. “μη γενοιτο”, for those wondering, is a Greek expression used a couple of times by Paul. It literally means “do not let it be so”. What it is conveying is something more like, “Heck, no!”. Translators generally write “By no means!”, or “Heaven forbid!”. See Romans 6:2, for example. The event in question is Adam and Eve’s initial moment of sin, in taking the forbidden fruit, described in Genesis 3. This is called the “Original Sin”. I have discussed the theology of Original Sin in another blog post: “Original Sin: The Original Meaning“, and I noticed afterwards that I had not mentioned “The Curse”. The reason is not that I made some “unfortunate omission”, but that there is, in fact, no curse (on Adam and Eve), contrary to [very] popular opinion. Hence, this partially related post. “Sometimes”? Well, I’d like to congratulate CMI on taking a stand at least that far. Many of their readers would miss this subtlety, but the article goes on to talk about “this judgement”, not “this curse”. It seems that they have become aware that God’s judgement, although it included curses, was not a curse on humanity. Perhaps the latter article is yet to be redacted, to account for a more recent adjustment in thinking? I can’t say for sure. We believe that human beings were created in the image of God but fell into sin and are therefore lost. Only through personal faith in Jesus Christ and regeneration by the Holy Spirit can salvation and spiritual life be obtained. That’s a pretty mainstream thing to be writing, but the mainstream may just be mistaken. For [just] one thing, it fails to account for the pre-Christ instances (at which time, of course, “personal faith in Jesus Christ” was not possible), where individuals are described very much in terms of salvation and spiritual life. In fact, it is this view which is instructing their interpretation of the Genesis 3 text, insofar as it relates to curses. Incredible, when no such curse is actually mentioned in the Bible. I have had people complain to me, as I point out what the Bible actually says, that although Eve’s childbearing pain, Adam’s labour in the soil, and the discussion around death, are not called curses in the Bible, they sure sound like a curse. Is that sufficient to call them “a curse”? Further, is it sufficient to go calling them, collectively, “The Curse“? We use the word “curse” pretty loosely in our modern vernacular. It generally means some kind of bad outcome, or wishing a bad outcome on someone. Using that kind of definition, Genesis 3 certainly does look like “a curse”. But the Bible is nowhere near as loose in it’s definitions! A curse is a very specific thing! In fact, “cursed” is equivalent to “cut off from Christ” in Romans 9:3, and as we will see, that is a key idea. It is important to note that in the original Hebrew there is no “exclamation mark”, so the literary device for emphasising a point is repetition. Hence, when something is repeated, particularly using the same phrasing, it is a point not only of connection between two texts, but of emphasis. Another key device is parallelism, in which something is repeated but is not exactly the same. This is a very flexible device, but suffice to say that when two things are placed side by side and they bear some similarities, but other potentially similar aspects are left out, it is an invitation to speculate as to why. God addresses the serpent in the form of a curse (Gen 3:14), and consequences (3:15), and the woman in terms only of consequences (Gen 3:16). 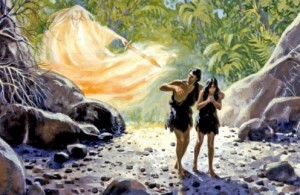 God then addresses the man and pronounces the curse on the earth (Gen 3:17), and lists consequences for Adam (3:18-19). Quite contrary to implying a curse on Adam and Eve, this rhetorical structure emphasises just how close they came, and yet avoided a curse from God! Had they been cursed along with the serpent and the land, the simple refrain “cursed are you” would have been used two more times, creating a formidable emphasis, the message of which would have been, “everything is cursed”. As it is, the message we ought to draw is, “everything deserved to be cursed, but for some reason God relented in the case of Adam and Eve”. The Story of Balak summoning Balaam to place a curse on the Israelites (Number 22-24) is a favourite for Sunday schools, and is sometimes used in sermons, but only because it features a talking donkey. The veritable plethora of sermons on that blasted donkey have all but drowned out the actual meaning of this important passage of Scripture (which does, after all, occupy three whole chapters of the Bible!). We can see that this “curse” is therefore about making the Israelites vulnerable to defeat. Ok, first clue: If Adam and Eve had been cursed at the Fall, how is it that God is calling people “blessed” here, in direct contrast to the concept of a “curse”? Wait, what? “Whom God has not cursed”? Yep. That’s right. This is a people not cursed by God. In the end, Balaam pronounces a blessing over Israel (Numbers 24:15-24), and goes away. … and back at the point of Genesis 3 in the narrative, the “entire People of God”, indeed, the whole human race, consisted of Adam and Eve. It should by now start to become clear just how difficult it is to sustain the suggestion that God cursed Adam and Eve! What is so special about them anyway? Why is it so important that Adam and Eve, and for that matter “the People of God”, cannot be cursed? Is it just some nice gesture on God’s part? Can anyone be cursed by God? Now if that is so (and it is), then we must also realise that every person ever to have been born since, was in Adam when he sinned (Idiomatically, “in his loins”). In fact, this is part of the reckoning of “Original Sin”: In a sense, we all were there. This principle is frequently used as an argument for (or at least, part of explaining) a general curse on mankind at the Fall. But there was another there, too. Whatever else we make of Jesus’ genealogies in Matt 1 and Luke 3, and whatever we suppose about the Immaculate Conception, insofar as he was born “of God”, we are still left to reckon with the very real notion that Jesus was “Son of Man” (over 80 times in the New Testament), and “Son of David” (15 times in the New Testament). This means that we must see the People of God as, in some vital way, the bearers of the Christ. He emerged from among that people, and was descended from their ancestors. As a consequence, we can see that Christ was in Adam (“in his loins”), right there at the Fall. Christ was also in the People of God when Balaam was prophesying. But Christ was not in Cain because it was through Abel’s offspring that Christ’s ancestral line is reckoned. Nor was Christ in any other apostates who fell away from the People of God. He was always “in” the faithful remnant, because his ancestry is the faithful remnant. Therefore, Christ was in Adam at the Fall. 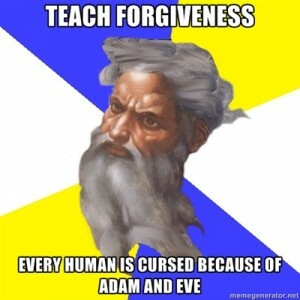 That is (at least one reason) why God could not and did not curse Adam and Eve. Instead he rescued them, clothing their nakedness, and leaving them only with some painful consequences. Indeed, the very earth itself was cursed instead of Adam and Eve. They were that precious. Oh, yes! Yes, he did… and what curse was that? In other words, Deuteronomy contains both blessings (28:1-14) and curses (28:15-68). Paul is saying that everyone who wants to be measured according to Moses’ words is calling these curses on themselves unless they obey every single one, always. It is not a reference to the Fall, and the Garden of Eden. Even more specifically here, Paul clarifies that we are talking about “the curse of the law”, which means Moses’ Law. There is simply no way to relate this to the Genesis 3 Fall. Rather, Paul is showing how Jesus’ ministry, culminating in his Lordship, saves the Jews from the need to submit to the holy, but completely unforgiving written code of Moses. Instead, they can enjoy the freedom and liberty of entering a new covenant, in which the “law” is “written on the heart” of the believer instead. This happens because Jesus “becomes” the anathema itself. But in so doing, since he is the Christ, breaks it. This is precisely parallel to entering death, and breaking that, too. The serpent having been dealt with in previous chapters of the Book of Revelation (Rev 20:10), all that remains to be resolved is the curse upon the earth. In this passage, the final chapter of the Bible, the curse is simply reversed. This happens as the final book-end to the whole grand Biblical narrative. Genesis 3 is not the pronouncement of a curse on mankind. Indeed it simply cannot be, because Christ is in Adam, and cannot be cursed. This should serve to undermine confidence in the doctrine of “Total Depravity”, as it is known. In fact, Genesis 3 describes a saving act of God, setting the typical pattern for the whole of the Biblical narrative: mankind will fail to live up to God’s requirements, but a certain remnant will be saved from the consequences of their failure by a gracious God. Ultimately, this will be realised through Jesus Christ, who will emerge from among those very people. The curse is death, which was a punishment to Adam and all of mankind at the fall. Christ became the curse for us on the cross, conquering death, thereby reversing the curse. The “curse” language doesn’t need to be in Genesis because Paul clarifies it in Romans 5:12-14. Thanks for dropping by and spending the time to make a comment! Romans 5 uses terms like trespass, wrath, and sin to describe the “problem”, and words like gift, reconciliation, and justification to describe the “solution”. In the whole chapter there was plenty of room to use the word “curse”, and Paul uses that word plenty elsewhere. He most specifically did not employ that term in Romans 5. Why not? The reason is that he’s not talking about a curse. He is talking about sin and death as a pattern of natural (and/or supernatural) consequences. He is saying that in Christ, through grace, those consequences are mitigated. But he doesn’t talk about a curse here because there isn’t one. In the article above I talk about the fact that in the Bible a “curse” is a very specific thing. It is not just a casual term used to describe something “bad”. To curse someone is to exclude them, cutting them off, usually from some sort of inheritance. So I confidently assert once again, that the Bible does not say Adam and Eve were cursed. I also, in the article above, point out why it literally could not happen, just as Balaam could not curse Israel. I recommend working through that logic to see why the New Testament so carefully avoids labeling it a “curse”. This is, of course, good news. It means that God always had a redemption plan for humanity. A general curse would mean there was no such plan.